We study a problem of data packet transport between a pair of vertices on scale-free network, and introduce load of a vertex as the accumulated sum of a fraction of data packets traveling along the shortest pathways between every pair of vertices. It is found that the load distributions for many real-world networks follow a power law with an exponent δ which is close to either 2.2(1) (class I) or 2.0 (class II), insensitive to different values of the degree exponent γ in the range, 2 < γ < 3. 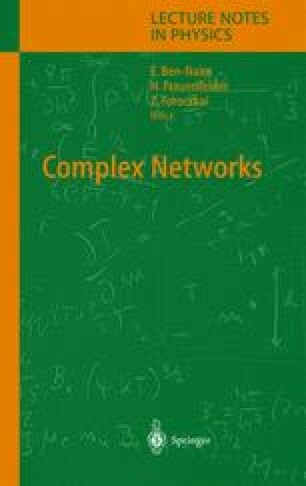 The classification of scale-free networks into the two classes may stem from the characteristics of the shortest pathways structures. While the shortest pathways between a pair of vertices are multiply connected in the class I, they are almost singly connected in the class II. Such distinct topological features of the shortest pathways produce different behaviors in diverse problems such as the distribution of diameter change by the removal of a single vertex. Finally, we remark that since the two numerical values of the load exponent are too close, it still remains an open question if they are really robust. Analytic solution resolving this controversial issue is needed.